A regular breeding resident and migrant in forest habitats. The Ovenbird was an abundant species during the Minnesota Breeding Bird Atlas (MNBBA). The Ovenbird is broadly distributed across the boreal forests of Canada, from northeastern British Columbia through the Maritime Provinces. In the United States it is found from eastern Montana and the western Dakotas south to Arkansas and east to northern Alabama, Georgia, and South Carolina. Despite its wide range, the birds are uncommon to absent in large areas of the midwest corn belt and eastern Dakotas. The densest populations are found where extensive forest habitat remains, including the Great Lakes states (Figure 1). A long-distance migrant that winters primarily in Central America. A ground gleaner that feeds on invertebrates. Domed cup nest placed on the forest floor; its resemblance to a dome-shaped Dutch oven is the source of the bird’s common name. Breeding distribution and relative abundance of the Ovenbird in North America based on the federal Breeding Bird Survey, 2011–2015 (Sauer et al. 2017). It was formerly an abundant breeding bird everywhere in the forested portions of the state but is much less common of late years in the southern woodlands where it has almost disappeared as a summer resident from localities where it was once abundant. . . . It is still a common bird in the northern forests where conditions have altered little, but it is apparently decreasing even there. On the prairies in woodlands that bordered the region’s lakes and streams, the Ovenbird was “much less frequent and chiefly a migrant.” Nesting was either confirmed or inferred from 8 counties (Aitkin, Becker, Cass, Hennepin, Isanti, Marshall, Stearns, and Wabasha) and from Itasca State Park. Forty years later, Green and Janssen (1975) reiterated Roberts’s (1932) comment regarding the species’ decrease in abundance in southeastern Minnesota. Because Roberts’s account did not include breeding records or summer accounts from the western agricultural region of the state (other than from the aspen parklands in eastern Marshall County), the authors believed that the Ovenbird’s former status in the region was uncertain. There were, however, recent summer reports from counties in both western and southern Minnesota. A few years later Janssen (1987) characterized the species’ breeding range as occurring primarily in northern, east-central, and southeastern Minnesota. Scattered summer records from as far west as Nicollet and Brown Counties along the Minnesota River valley, and from Nerstrand Woods State Park in Rice County and Camden State Park in Lyon County suggested that the species was a “casual breeder” in some areas of south-central and southwestern Minnesota. Janssen included a statewide distribution map that identified 15 counties where nesting had been confirmed since 1970. Hertzel and Janssen (1998) later added an additional 9 counties to the list, all within the species’ primary breeding range. Field biologists with the Minnesota Biological Survey (MBS) have documented 3,409 breeding season locations for Ovenbirds during the course of their statewide fieldwork. The vast majority of records were from the northern forests of the Laurentian Mixed Forest Province, yet records also were distributed throughout the Eastern Broadleaf Forest Province, the Tallgrass Aspen Parklands Province, and the Minnesota River valley west to Yellow Medicine County. A few records were scattered across southwestern Minnesota. MNBBA participants reported a total of 5,755 Ovenbird detections from 45.7% (2,180/4,769) of the surveyed atlas blocks and from 52.1% (1,217/2,337) of the priority blocks. Breeding evidence was confirmed in 89 surveyed blocks (Figures 2 and 3; Table 1). The birds were detected in 75 of Minnesota’s 87 counties and were confirmed nesting in 20 counties. Six counties where they were confirmed nesting were additions to the list published by Hertzel and Janssen in 1998: Carlton, Crow Wing, Mille Lacs, Pine, Polk, and Stearns. The Ovenbird was the 11th most frequently detected bird during the MNBBA. The distribution and relative abundance of Ovenbirds documented by the MNBBA were very similar to that documented by the MBS. They remained most abundant in the Laurentian Mixed Forest Province but were present also throughout the Eastern Broadleaf Forest and the Tallgrass Aspen Parklands Provinces. In western Minnesota they were distributed along the entire length of the Minnesota River valley and were well distributed in northern Kandiyohi County. Scattered observations again occurred in pockets of suitable habitat in southwestern Minnesota. The MNBBA predicted breeding distribution map reemphasized the importance of the northern forest region to the species (Figure 4). Although breeding densities are predicted to be highest in the Laurentian Mixed Forest Province, the birds also are well represented in the Hardwood Hills Subsection of the Eastern Broadleaf Forest Province in west-central Minnesota and in scattered pockets surrounding the Twin Cities metropolitan region. The only regions that appear totally inhospitable to this common forest bird are the Twin Cities and much of the intensively cultivated landscapes of south-central and southwestern Minnesota and the southern portions of the Red River valley. Historically, the Ovenbird’s distribution in the state appears to have changed little in the past century. Although its status in the western prairies may have been uncertain in the mid-20th century, both the MBS and MNBBA demonstrate that suitable habitat is currently present in the wooded floodplains along the entire length of the Minnesota River valley as well as in other scattered pockets embedded within the agricultural landscape. The species’ relative abundance in the forested regions of the state has likely declined as woodlands have given way to development and agriculture, especially in central and southeastern Minnesota. Nevertheless, the Ovenbird remains present even in these regions. Indeed, throughout North America, the breeding range of this northern forest species has remained remarkably stable (Porneluzi et al. 2011). Breeding distribution of the Ovenbird in Minnesota based on the Breeding Bird Atlas (2009 – 2013). Summary statistics of observations by breeding status category for the Ovenbird in Minnesota based on all blocks (each 5 km x 5 km) surveyed during the Breeding Bird Atlas (2009-2013). Summary statistics for the Ovenbird observations by breeding status category for all blocks and priority blocks (each 5 km x 5 km) surveyed during the Minnesota Breeding Bird Atlas (2009-2013). Predicted breeding distribution (pairs per 40 hectares) of the Ovenbird in Minnesota based on habitat, landscape context, and climate data gathered during the Minnesota Breeding Bird Atlas (2009-2013) using the General Linear Modeling method with an adjustment for detectability. Including both upland and lowland forest stands, the Ovenbird’s habitat can be broadly described as large, mature forests with closed canopies, a high basal area of medium-sized trees, an open understory, and an intermediate density of shrubs (Danz et al. 2007). Deciduous, coniferous, and mixed forests all provide suitable habitat (Figure 5). The National Forest Bird (NFB) Monitoring Program in northern Wisconsin and Minnesota demonstrated the wide range of forest habitats utilized by Ovenbirds in the core of their breeding range. Although the birds were most strongly associated with upland hardwood stands and white pine stands, these were followed close behind by a wide assortment of other mixed forest, deciduous forest, and coniferous forest cover types (Niemi et al. 2016). Habitat data collected within 200 m of MNBBA point counts where Ovenbirds were detected demonstrated a strong association with pine stands, northern mixed forest stands, and upland coniferous forest (Figure 6). The age of suitable forest stands is less important to Ovenbirds than the structural features. Even young, dense, pole-sized forests are used if they meet the basic requirements of a closed canopy and an open understory. In their summary of the literature, Porneluzi et al. (2011) determined that a canopy height of 16 to 22 m and a canopy closure of 60% to 90% were consistently found to be important parameters. Sites with less ground cover and deep litter layers also were favored. Ovenbirds display some sensitivity to the size of the forest tract, although the size of the tract required for successful reproduction is reported to be quite variable, ranging from 100 to 885 ha (Porneluzi et al. 2011). The species can be found in woodlands as small as 4 ha, but their reproductive success in such stands may be limited (Forman et al. 1976; Galli et al 1976). Small isolated stands can be reproductive sinks for a variety of reasons, including higher predation and parasitism rates, isolation from other Ovenbird populations, and diminished habitat quality (Porneluzi et al. 1993; Porneluzi and Faaborg 1999; Porneluzi et al. 2011). The size of the forest stand may not, however, be the only variable impacting the Ovenbird’s reproductive success. The negative effects of small forest tracts and forest edges may be less evident when the stands are embedded within landscapes that are extensively forested than when they are embedded in landscapes that are fragmented by development and agriculture. The importance of the regional landscape was borne out by studies in Minnesota that demonstrated that reduced nesting success of Ovenbirds due to edge effects was not evident in managed forest landscapes (Hanski et al. 1996). Despite their dependence on mature stands during courtship and nesting, many species, including Ovenbirds, rely on young, regenerating forest stands during the post-fledgling period, according to recent studies (Pagen et al. 2000; Marshall et al. 2003). Researchers speculate that the high density of saplings may provide additional protection during this period when the young are vulnerable. The Ovenbird has been an intensively studied songbird in Minnesota and across North America. Studies have placed a particular emphasis on the influence of habitat size, habitat conditions, and landscape context on nesting success. A few additional studies conducted in Minnesota include Matteson and Niemi (2006), Manolis et al. (2000), Manolis et al. (2002), and Matteson and Niemi (2008). Typical breeding habitat of the Ovenbird in Minnesota (© Lee A. Pfannmuller). Habitat profile for the Ovenbird based on habitats within 200 m of point counts where the species was present during the Minnesota Breeding Bird Atlas (2009-2013). An abundant forest inhabitant throughout much of its breeding range, the Ovenbird is one of the most common forest songbirds in North America. Data collected since 1966 by the Breeding Bird Survey (BBS) have been used to generate a North American population estimate of approximately 26 million breeding adults (Rosenberg et al. 2016). In 2013, Minnesota was estimated to support 5.5% of the continental population (Partner in Flight Science Committee 2013), which would result in a current Minnesota population estimate of 1.4 million adults. When MNBBA point count data were used in statistical analyses to estimate the statewide population, the estimate was significantly larger at 5.6 million adults (95% confidence interval of 5.4 – 5.8 million adults). Northern Minnesota is within the core of the species’ breeding range in the BBS area. The average number of Ovenbirds detected on BBS routes in the state each year is 22; in both Michigan and Wisconsin the average number of Ovenbirds per BBS route is 47 (Sauer et al. 2017). In northern Minnesota, the NFB Monitoring Program found the Ovenbird was the most common bird on the Superior National Forest; on the Chippewa National Forest it was second only to the Red-eyed Vireo. On the Chippewa breeding densities averaged 15.1 pairs per 40 ha; on the Superior breeding densities averaged 17.7 per 40 ha (Niemi et al. 2016). 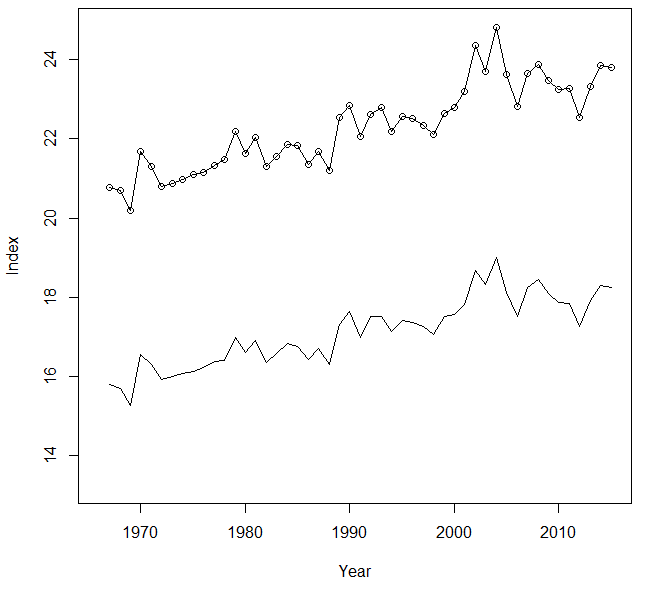 Since the BBS monitoring program began in 1966, Ovenbirds have shown a stable population trend (Sauer et al. 2017). BBS data in Minnesota show a similar trend with a nonsignificant, average annual increase of 0.28% per year (Figure 7). An initial increase in the early years of the survey has been moderated by more stable, albeit fluctuating, numbers in recent years. From 1995 to 2016, Ovenbird populations on the Chippewa National Forest have demonstrated a significant increase, while those on the Superior National Forest have been stable. The combined regional trend reveals a significant increase (Figure 8). The increase is likely due to the steady decrease in logging activity on both forests over the past 10 years, resulting in a greater proportion of older forest stands. In addition, there have been important changes in forest management practices over the years. Complete removal of the forest canopy when stands are clear-cut is less common and is being replaced by clear-cuts that leave ample trees or by selective harvesting that removes only a portion of the mature canopy. These methods retain some of the stand’s structural complexity, thereby improving opportunities for mature forest species like the Ovenbird (Zlonis et al. 2014). Breeding population trend for the Ovenbird in Minnesota for 1967–2015 based on the federal Breeding Bird Survey (Sauer et al 2017). 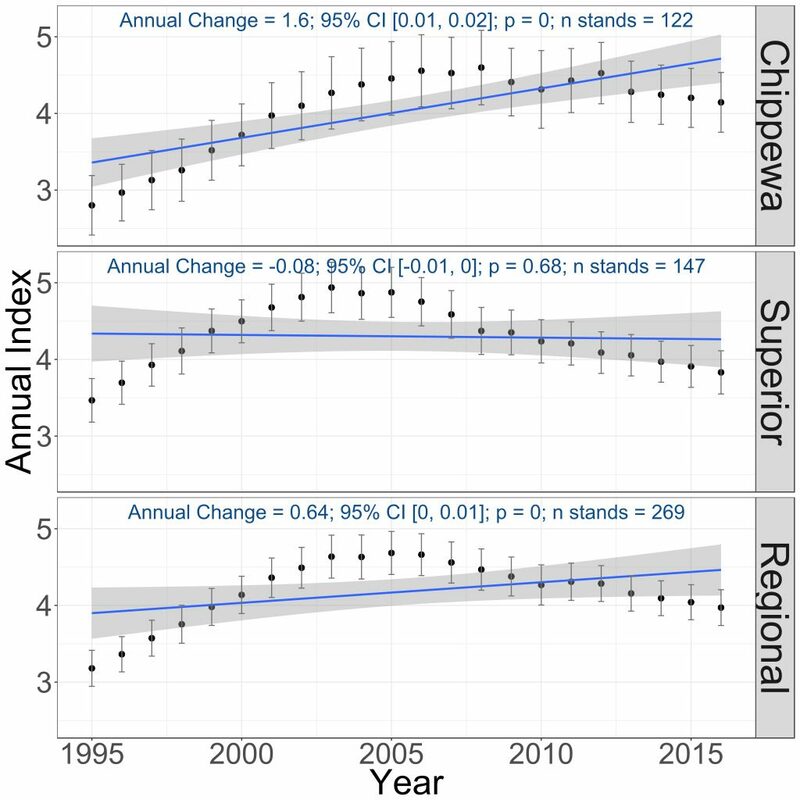 Breeding population trends of the Ovenbird in the Chippewa and Superior National Forests and the combined regional trend, 1995–2016 (Bednar et al. 2016). Because of its abundance across southern Canada and the northern United States and its stable population, the Ovenbird is not considered a species in need of focused conversation efforts. It has been assigned a moderate Continental Concern Score of 9/20 by Partners in Flight (Rosenberg et al. 2016). The Partners in Flight Bird Conservation Plan for the Boreal Hardwood Transition Region, which includes northern Minnesota, establishes a broad conservation goal for all forest-dependent songbirds. The plan recommends maintaining large contiguous forest tracts, restoring connectivity, maintaining a well-developed understory, and managing a diversity of successional ages (Matteson et al. 2009). Minnesota’s rich tradition of broad interagency coordination to manage the state’s northern forests should help insure these recommendations are integrated into forest planning initiatives. Outside of the more densely forested landscapes of northern Minnesota, the focus should be on maintaining quality habitats on the forest-grassland and forest-urban borders, where reproductive success is likely compromised by the smaller size of the stands and their greater isolation from the broader forest landscape. Although the Ovenbird’s future would appear relatively secure in Minnesota, the species must contend with several human-induced threats. The species is 1 of 28 bird species recently identified as having experienced a disproportionate level of annual mortality at communication towers (Longcore et al. 2013). Estimated annual mortality is nearly 500,000 birds, or nearly 2% of the total population. They also comprised nearly 6% of the fatal window collisions recorded during five migratory periods on Minnesota Point in Duluth, Minnesota (Bracey 2011). Another concern for this ground-nesting species is the impact of European earthworms on the forest litter layer. One recent study demonstrated the direct link between the presence of invasive European earthworms and lower breeding densities of Ovenbirds in Minnesota and Wisconsin’s northern forests (Loss et al. 2012). Warmer temperatures also pose a threat to Ovenbird populations. The National Audubon Society has classified the species as “climate threatened”. Modeling predicted that the species could lose 67% of its current breeding range by the year 2080, potentially forcing it to move farther north into Canada, including into areas currently north of the tree line (Langham et al. 2015; National Audubon Society 2016). It is hard to imagine a future without the Ovenbird’s familiar Teacher Teacher Teacher song belting out from the forest understory. Although it is unlikely to be the case in the near term, history has taught us to never take for granted the most common and abundant species. Forman, Richard T. T., Anne E. Galli, and Charles F. Leck. 1976. “Forest Size and Avian Diversity in New Jersey Woodlots with some Land Use Implications.” Oecologia 26: 1–8. Hanski, Ilpo K., Timothy J. Fenske, and Gerald J. Niemi. 1996. “Lack of Edge Effect in Nesting Success of Breeding Birds in Managed Forest Landscapes.” Auk 113: 578–585. Loss, Scott R., Gerald J. Niemi, and Robert B. Blair. 2012. “Invasions of Non-Native Earthworms Relative to Population Declines of Ground-Nesting Songbirds across a Regional Extent in Northern Hardwood Forests of North America.” Landscape Ecology 27: 683–696. Manolis, James C., David E. Andersen, and Francesca J. Cuthbert. 2000. “Uncertain Nest Fates in Songbird Studies and Variation in Mayfield Estimation.” Auk 117: 615–626. Marshall, Matthew R., Jennifer A. DeCecco, Alan B. Williams, George A. Gale, and Robert J. Cooper. 2003. “Use of Regenerating Clearcuts by Late-successional Bird Species and their Young during the Post-fledging Period.” Forest Ecology and Management 183: 127–135. Mattsson, Brady J., and Gerald J. Niemi. 2006. “Factors Influencing Predation on Ovenbird (Seiurus aurocapilla) Nests in Northern Hardwoods: Interactions Across Spatial Scales.” Auk 123: 82–96. Mattsson, Brady J., and Gerald J. Niemi. 2008. “Causes and Consequences of Distribution Patterns in a Migratory Songbird Across its Geographic Range.” Canadian Journal of Zoology 86: 314–328. Pagen, Rich W., Frank R. Thompson III, and Dirk E. Burhans. 2000. “Breeding and Post-Breeding Habitat Use by Forest Migrant Songbirds in the Missouri Ozarks.” Condor 102: 738–747. Porneluzi, Paul A., and John Faaborg. 1999. “Season-long Fecundity, Survival, and Viability of Ovenbirds in Fragmented and Unfragmented Landscapes.” Conservation Biology 13: 1151–1161. Porneluzi, Paul A., James C. Bednarz, Laurie J. Goodrich, Nancy Zawada, and Jeff Hoover. 1993. “Reproductive Performance of Territorial Ovenbirds Occupying Forest Fragments and a Contiguous Forest in Pennsylvania.” Conservation Biology 7: 618–622. Zlonis, Edmund J., Alexis R. Grinde, Elizabeth [Elisabeth] Condon, Hannah G. Panci, Yang Li, Ronald R. Regal, and Gerald J. Niemi. 2014. Summary of Breeding Bird Trends in the Chippewa and Superior National Forests of Minnesota: 1995–2014. Natural Resources Research Institute Technical Report NRRI/TR-2014/44. Duluth: University of Minnesota Duluth, Natural Resources Research Institute.